Albany Court was a small ‘court’ of dwellings at right angles to Union Street, between the building on the corner of Union Street and Peter Street (the predecessor of Broadway House) and Albany Buildings. The site is now occupied by Mulberry’s restaurant and originally comprised some three or four dwellings. The entrance to the old court today is the closed-off alley to the side of Mulberry's. This part of Union Street was, until the 1870's, still called Wine Street. The northern part of Union Street was built in the 1830's by Peter Daniell. Albany Court is not shown on Bidder's map of 1843 but does appear on the 1886 Ordnance Survey. It is not named as such on any nineteenth century census returns (until 1891) and its occupants were included within Wine Street until 1871 and as Union Street in 1881. In the 1891 census the name of the court is listed however it was not listed as Albany Court but sadly the new name of the court is illegible in the return. It did, however, confirm there were three dwellings occupied by the families of a coach body maker, a tailor and a farm labourer. 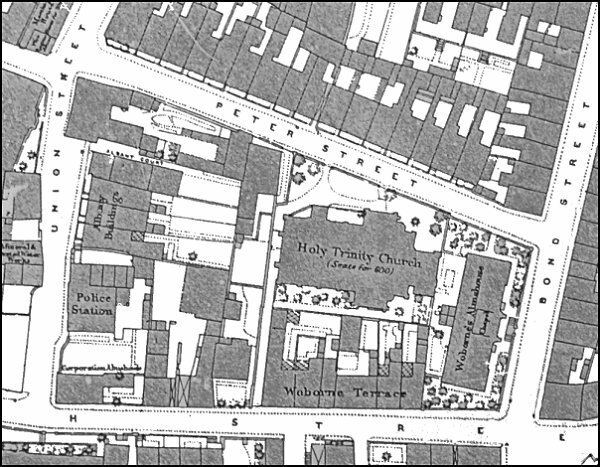 Map based on the 1886 Ordnance Survey showing Albany Court running alongside the north of Albany Buildings, off Union Street, to the right of the second 'N' in Union.